It’s crazy how much you can learn and to what degree your perspective can shift to alter your opinion when you quite simply open your eyes. People tend to experience cities ‘the way they’re supposed to’. That is to say, the main streets. Activity follows official destination and purpose – retail, office, public space, nodes, entertainment and attractions. 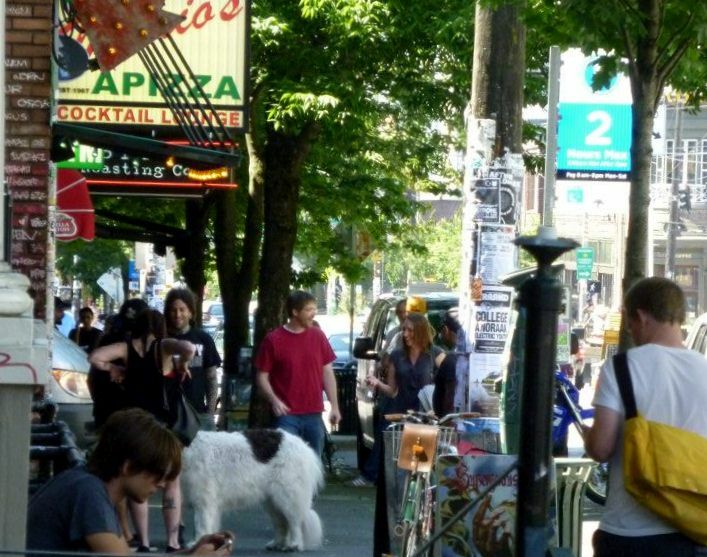 These places are the face of a city – the parts that people recognize and thrive off of. But think of your good friends, and think about how you truly know them. I mean, really know them. It is understood that when you get to know someone well, you learn about who they truly are on the inside. Perhaps, this might be called ‘the soul’. I believe cities work in that same way. There are many different ways one can identify the true soul, heart, or spirit of a city, such as with culture, people, and values of a place. But one aspect, common in every city, has been known to be a realm of true expression, but also of disrespect and controversy. 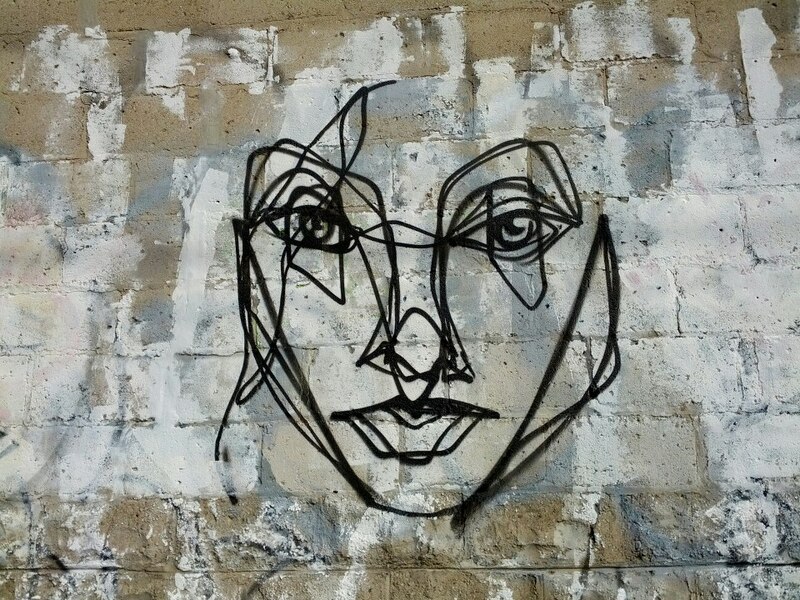 If you look just around the corner and under the ‘skin’ of a city, you will begin to notice and discover street art. Most people have a strong opinion about street art. They hate it with a passion, they adore it and follow it, or they feel relatively neutral towards it because they don’t really pay attention to it. People who dislike street art are more likely to call it ‘vandalism‘ because it has affected them directly in a negative way. I believe that this is a very good point – it doesn’t really seem fair to go to work in the morning only to realize someone has tagged some sort of half-assed scribbly-looking thing on the window of your shop. It’s hurtful, inconvenient, disrespectful, and seems just plain useless, right? 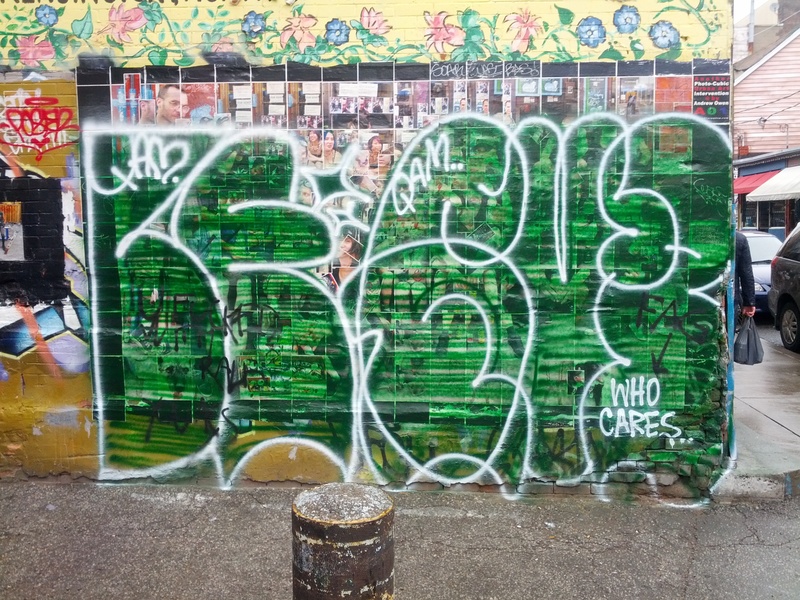 What makes people think they can just walk up to someone’s property and ruin it with an egotistic tag of their undecipherable sudo graffiti name? It’s a valid argument and has a lot to do with common courtesy. 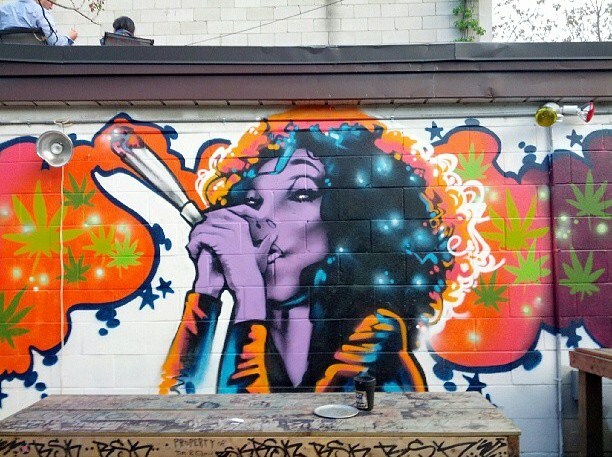 I like to say that people who love street art have been blessed with enlightenment and understanding. Because when you open your eyes to the world of street art, peer just behind the curtain and look, you realize so many things. First of all, I think you realize that the people who are ‘vandalizing‘ property in a tasteless way are ruining it for everyone. Every street artist is suddenly ignorantly thrown into one big basket, assuming they are all ‘bad people‘ that are capable of disrespect. A throwie over AO1’s Kensington wheatpaste. If you’re REALLY lucky store owners will respect your work too. 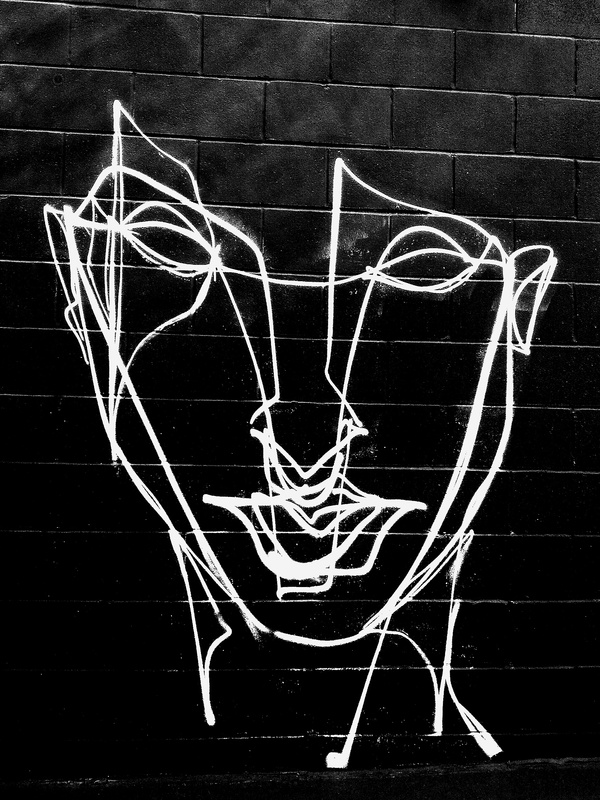 In the following picture, another one of Anser’s unwarranted faces sits on a the side of a shop off Dundas West. 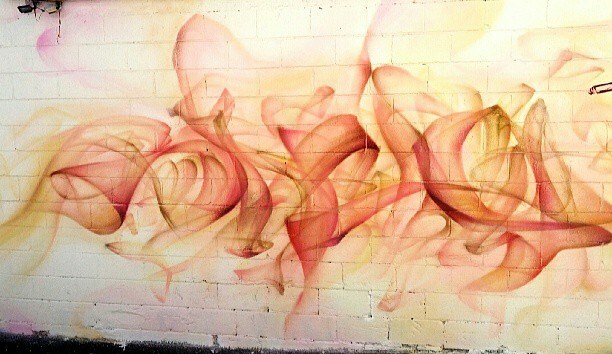 Over time other taggers began hitting the wall next to Anser’s face. 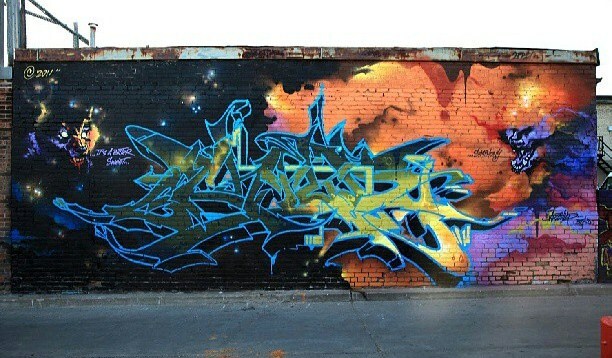 When the owner took out his paint bucket to re-paint the wall as he usually does, he painted over everything and left Anser’s face. He must have really liked it. The theme of respect comes up a lot when I learn about and think about graffiti and street art. So this got me thinking a lot about street art history, legislature, and perception or education. If this form of expression is highly based on creating appealing art and valuing respect, why is it not tolerated, and why is it not more engrained in the status quo of our lives? The first piece that truly moved me. It may not move you, because it may not be in line with what you like in art, which is fine. 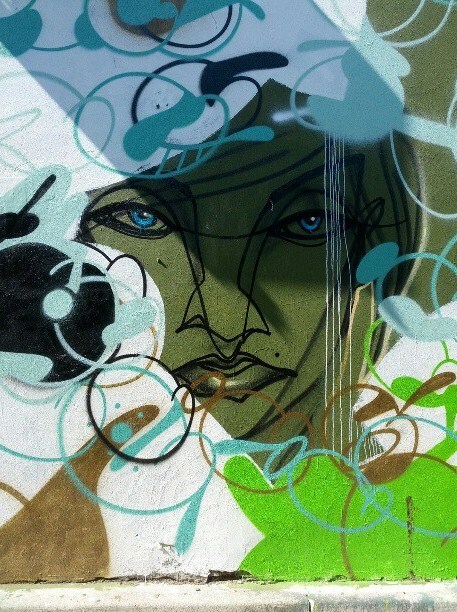 But it really hit me deep and I realized that I did in fact love street art – just not all of it. And in that realization, I also realized that you don’t need to like all of it to like street art. It’s like an art gallery – you walk through it in the same way you walk the alleys, and you observe. You’re probably going to like less than half of what you see, and only a few will truly smack you in the face with a big fat WOW. 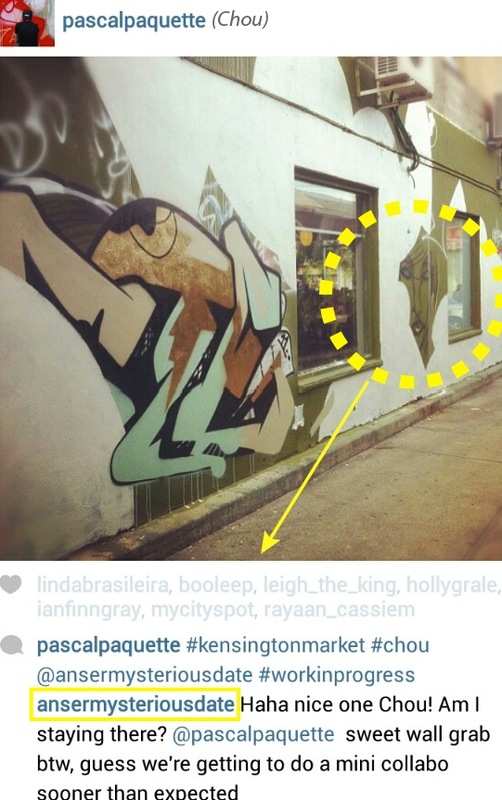 So here comes the big question – what makes unwarranted (illegal) street art ‘okay’? Most people would say that if anything is illegal then it’s a black and white matter. Illegal = shouldn’t happen. But what if I were to propose that, under certain circumstances, unwarranted street art is currently sitting in a grey area? If most people could agree that there are in fact certain times or ways that unwarranted graffiti can be enjoyed, doesn’t that mean that something about it is acceptable? Doesn’t that warrant some kind of upgrade into the legal side of things? It’s ironic that streetart fosters so much ignorance and disrespect, when it is based in awareness and respect, isn’t it? So my conclusion is as follows: if the ignorance of the people could be uplifted in some way, and if the true goodness of streetart culture could be brought into the foreground (less taboo), then less vandalism would occur and less viewers would dismiss the activity as a whole. But at the end of the day… talk to any street art or graffiti veteran and they’ll tell you – struggle or none – that the culture belongs behind the curtains. I guess knowing where to ‘draw the line’ will have to wait another day. I want to hear your opinions and stories – sound off in the comments. “It is difficult to design a space that will not attract people. What is remarkable is how often this has been accomplished” – William H. Whyte. It is not difficult to design a space that people will love, but it is difficult when the odds are against the designer. 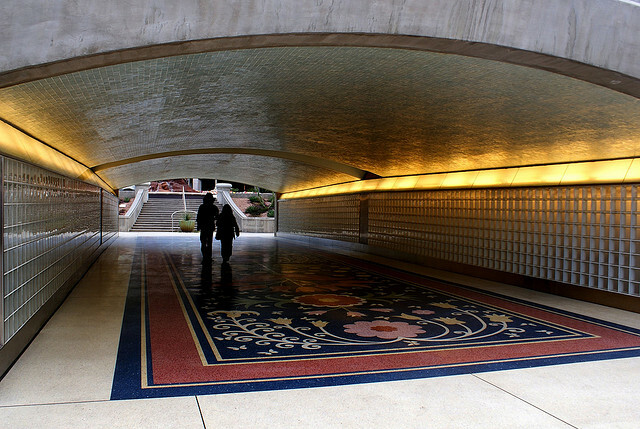 I’m talking about pedestrian underpasses – the most ironic design principle dead end. The intended purpose of a pedestrian underpass aims at introducing a chance for pedestrians to continue their journey and create opportunity for mobility through environments containing blocked areas (highways, buildings, etc), but unfortunately these areas are often left neglected or are poorly designed, plaguing them with negative associations… unsafe, dark, dirty, uncertain, avoid – all percieved descriptors that most people would associate with pedestrian underpasses. 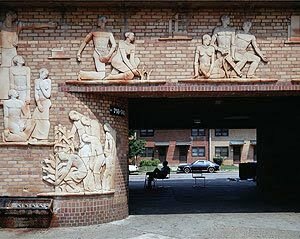 Identity/Landmark: Make the underpass a landmark to help users understand a recognizable point of reference in a larger space to aid with orientation. A character and sense of place will be created. To emphazise the location and its usefulness, the underpass should be highlighted in some way on a network map. 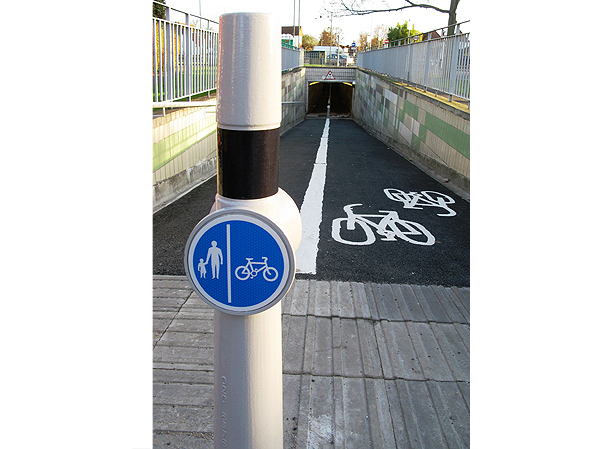 Navigation: The underpass should clearly navigate users through it as opposed to around it etc. as it is a thoroughfare, not a long-term destination. Signs: By incorporating a sign of the overall pedestrian system near the underpass, the navigator will be able to place the entire space within his or her view and consequently be able to deduce where they are, what is in their immediate vicinity, what destinations are available, how to get there, and how long it will take them (ped shed). 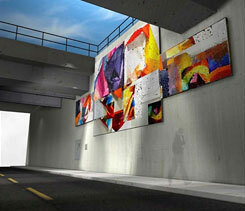 The underpass as a decision point will help foster it as a landmark and as a safe and reliable passageway. Sightlines: A first time user may have uncertain expectations as to the underpasses extent and purpose – to avoid this uncertainty, the sightline through the underpass should be clear in order to give the user enough information about what is ahead and to encourage them to move or continue further. Connectivity: An underpass will only be used if it is connected to a network, therefore it should be connected to some sort of pedestrian system. It is also important for users to be aware of that through marketing, signage, and clarity on-site. 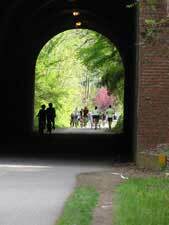 Natural Surveillance: an underpass should be designed in such a way as to facilitate observation by increasing visual permeability and sightlines in order to see what is ahead and around the site. Visual permeability will increase the potential for ‘eyes on the street’. 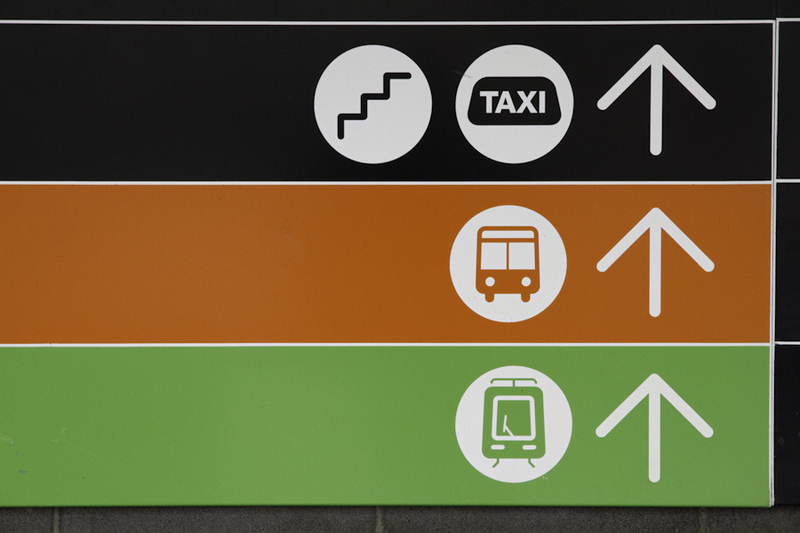 Since sightlines cannot be achieved from all perspectives through an underpass, wayfinding techniques can be used to reassure the user. Encouraging visitors to progressively and passively use the site is also an effective form of natural surveillance. Natural Access Control: an underpass should be designed in such a way as to direct normal access to observable areas and prevent access to unobservable areas. 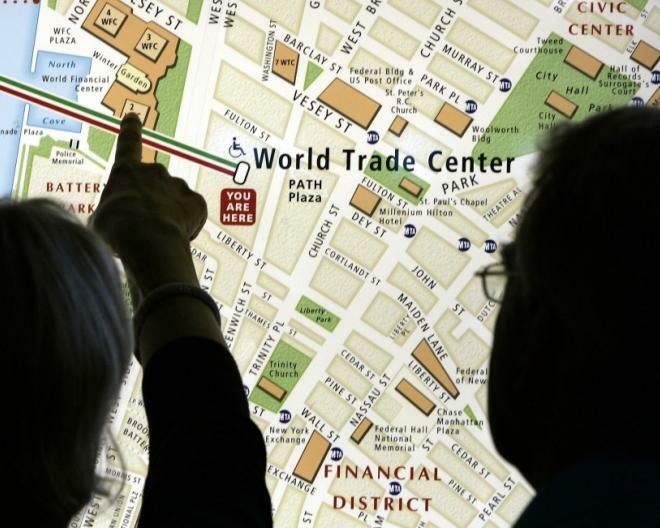 The path should have a clear sense of direction, and wayfinding techniques can create a sense of anticipation for what is coming next to keep movement flowing. Territorial Reinforcement: an underpass should be designed in such a way as to enhance the feeling of legitimate ownership by implementing symbolic or psychological barriers such as bollards and signs, and to minimize the creation of ambiguous spaces, such as gaps and corners. 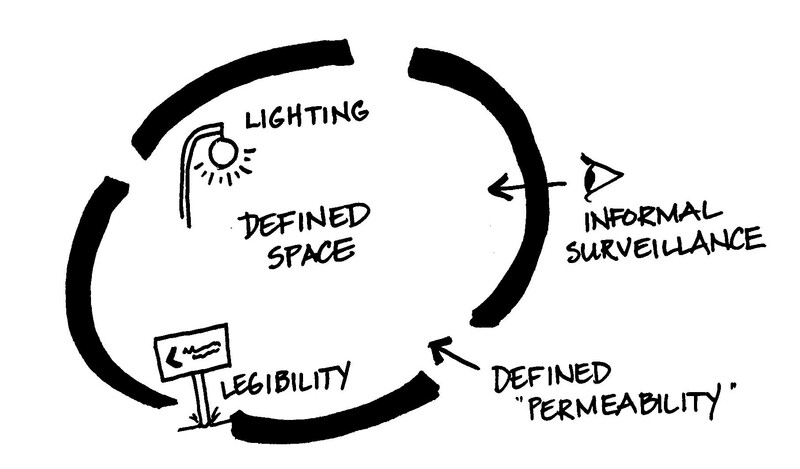 Mechanical Forms of Surveillance & Access Control: Such as uniform white lighting should also be applied. 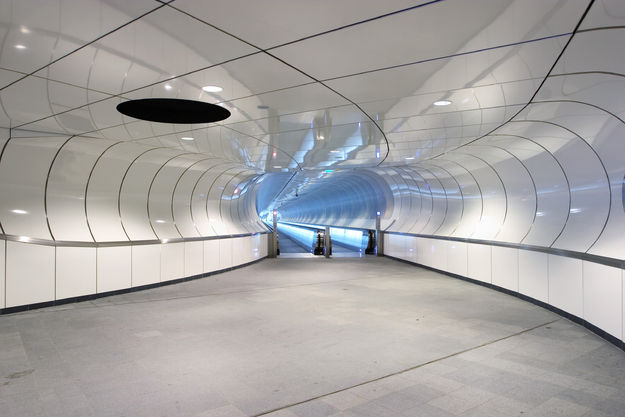 Image: An underpass should be designed in such a way as to enhance and maintain its physical appearance to encourage users of the area to respect their surroundings. 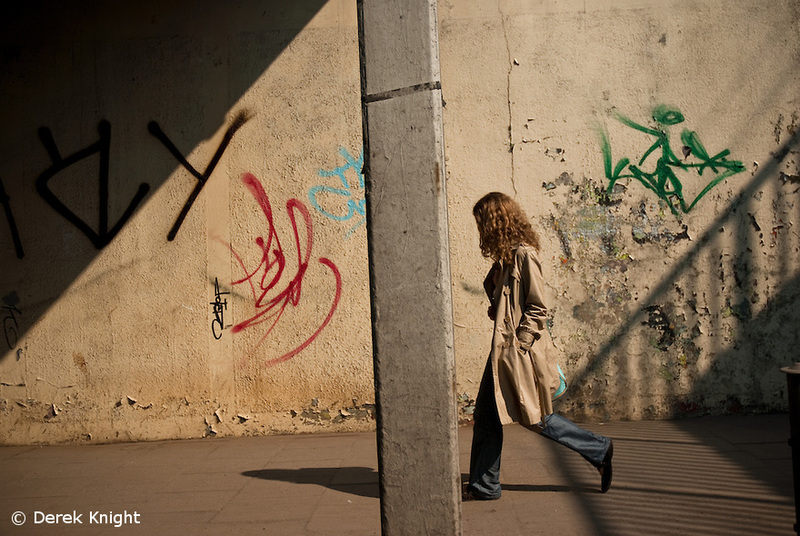 The more dilapidated an area, the more vulnerable it is to further abuse. Approach: The entrance and exit of the space should be clearly defined and anticipated using branded signs that tie in with the rest of the trail or the City’s branding, to make it official and trustworthy. 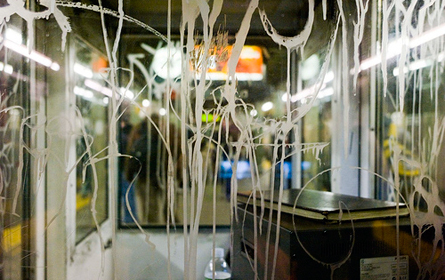 Maintenance: The underpass should be maintained in the following ways – infrastructure maintenance, standard cleaning, and responsive cleaning (graffiti). Dimensions & Distractions: for underpasses, a line of street furniture or greenery is not recommended. 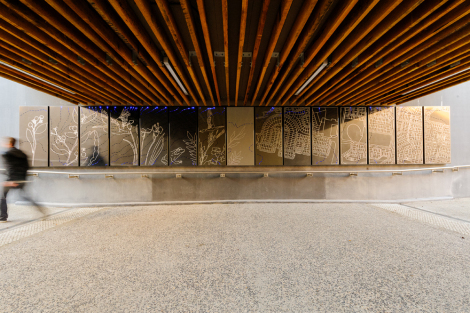 Instead, 2D or 3D (relief or installation) designs on any of the four facades (walls, ground and cieling) are recommended. 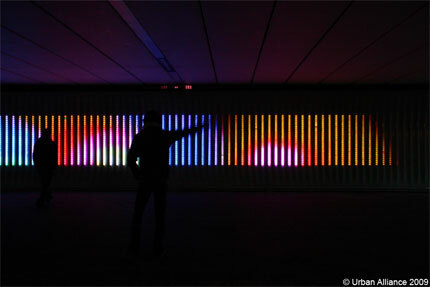 Lighting: often times underpasses are short with an opening in the middle, which is great for lighting. 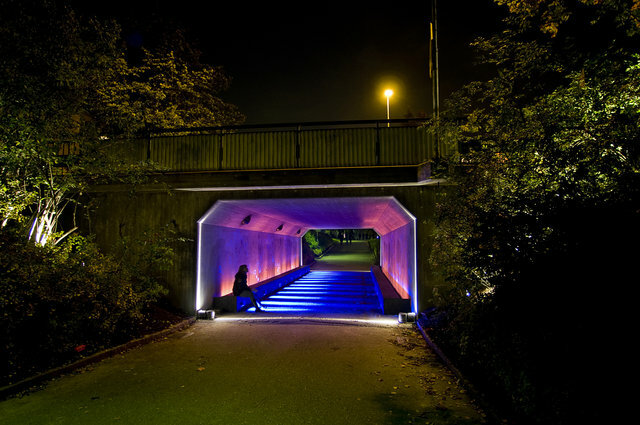 However, with no additional luminaire fixtures the longer underpasses and the night scene for any sized underpass can become quite dreary. Additionally, weak or unpleasant colored lighting (yellow) can be unattractive as well. 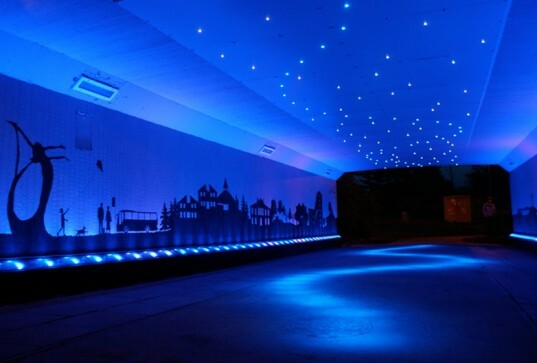 A well-lit (white) and brightly-colored (white) underpass can put it in a perceived ‘spotlight’ and discourage tagging and even crime due to a fear of being seen and caught. This technique obviously plays a huge role with personal safety as well. At the end of the day, underpasses may be an awkward problem to solve, but what’s life without a challenge, right? 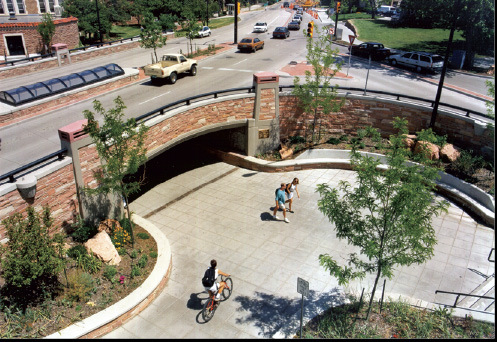 An enjoyable, useful and safe pedestrian underpass is possible.